REMINDER: Weeknight Detour of Dulles Greenway for Silver Line Construction Starts Tonight Tuesday, Dec. 19 at 11 p.m. - Wednesday, Dec. 20 at 5 a.m.
Tuesday, Dec. 19 at 11 p.m. - Wednesday, Dec. 20 at 5 a.m.
the westbound Dulles Greenway between Old Ox Road and the Loudoun County Parkway will be detoured to secondary roads while Dulles Corridor Metrorail Project crews set a pedestrian bridge that will provide access over the highways to the Silver Line's Loudoun Gateway Station. See details below and Figure 1 on the next page. 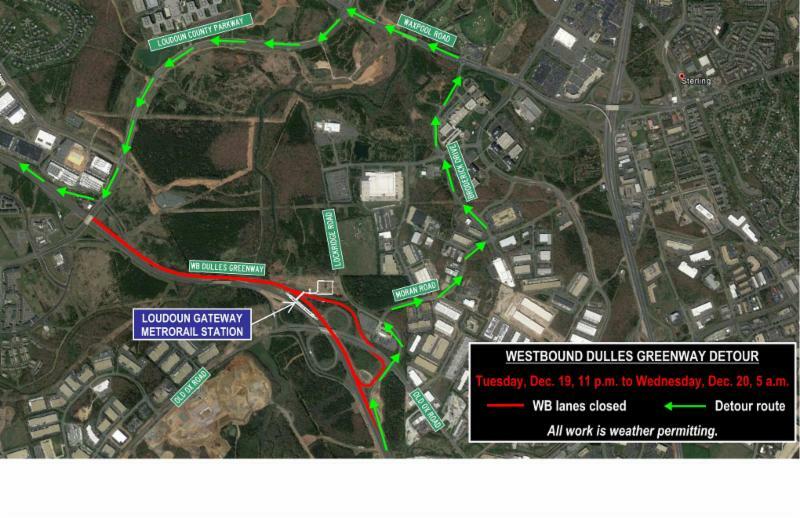 WESTBOUND DULLES GREENWAY: Tuesday, Dec. 19 at 11 p.m. through Wednesday, Dec. 20 at 5 a.m. Single lane closures on the westbound Dulles Greenway will begin at 8 p.m. near the mainline toll booth and transition to multi-lane closures, including the two far left toll booths at the mainline toll plaza. The mainline toll booth gates will be open and no toll will be charged at this location. At 11 p.m., all traffic on the westbound Dulles Greenway will exit the highway at Old Ox Road (Route 606) East. The ramps to the westbound Dulles Greenway eastbound and westbound Old Ox Road will be closed. At the top of the ramp, proceed straight across Old Ox Road to Moran Road, then turn right to continue on Moran Road. Turn left onto Broderick Drive, then turn left onto Waxpool Road. Turn left onto the Loudoun County Parkway. Continue south on the Loudoun County Parkway to return to the westbound Dulles Greenway, proceeding through the toll booths, where tolls will be charged. Figure 1: Traffic on the westbound Dulles Greenway will be detoured between Old Ox Road and the Loudoun County Parkway.